HW:TeII me about your bike! HW: How long have you been riding? HW: How did you get into riding? Jackie: This is how we got “Harley-ized”, I have to say we, because it happened to my husband, Randy, and I at the same time… A really good friend, Richard, bought a Harley in 1984, I remember him riding up the driveway, the minute I laid my eyes on his bike, a white FLH Police Special… I fell in love. My husband and I started salivating. From that day until my husband bought his first bike, all we did was talk about buying a Harley. My husband got his first bike about a year and a half later, within two months we went from Malibuto Vancouver, with five other friends on a two week trip. I was the only passenger and the only girl! My mission on this trip was to decide about riding whether I liked being a passenger or if I wanted my own bike. My immediate conclusion was that the riders were having a lot more fun than me. That trip was in July of 1986, I had my bike by October of that year. HW: Where did you learn to ride? Jackie: I went to the Motorcycle Safety Foundation Course, however, I really give credit to Bob Laidlaw – Laidlaw’s Harley­Davidson in Los Angeles (Rosemead). I was at Bob’s shop to looking for a bike, I found the bike that I now own. I told Bob that I wasn’t really sure if I was ready to ride yet that I had just grad uated from the safety course and that I didn’t really have much confidence. Bob immediately said, “Get on we’re going for a ride!” So off we went, it kind of freaked me out to have a full-grown man riding behind me as a passenger, but we got out there and rode around for about an hour. Bob gave me a lot of riding tips and just sat behind me and talked to me as we were riding–I think that experience was even more important to me than the course. HW: Do you wear a helmet? HW: What’s your favorite organized run? Jackie: The “Love Ride”, it starts in Glen­dale and goes to Malibu where we all meet at Calamigo’s Ranch for a giant picnic, there are about 4,000 bikes, mostly Harleys, it takes place each November. 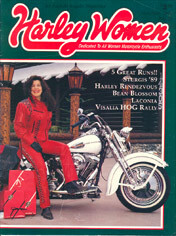 HW: Do you ride with other women biker’s in the area? Jackie: Not really. I don’t know a lot of other women with their own bikes, but the longer I ride the more women I meet. I think that it would be wonderful riding with other women, as most of us have the same thing in common. We all tend to be free-spirited women who are adventur­ous, and are willing to try things that tra­ditionally would seem unfeminine, but really aren’t, such as riding a motorcycle. HW: Do you have any thoughts to share about owning your own bike? Jackie: The most important thing about having my own is that it really gives me a chance to express my free-spirit and a sense of true freedom. HW: Let’s talk about your shop…where are you located? Jackie: In the heart of Malibu, in the civic center area right off the Pacific Coast Highway. HW: How did you get started working with leather? Jackie: In 1970 I moved to Laguna Beach from West Hollywood where I grew up. My goal was to be an artist, I had trained and studied art all through school. I opened up a tiny studio where I slept in a tent on the porch. I tried to do the starving artist routine, it got old real fast. I had sewn all my life and I always loved fashion, so I applied for a sewing job in a leather shop… that was my start. I left Laguna two years later and went back to L.A. where, I was able to get a job in a saddle shop. About a year later I moved to Malibu. Soon I was looking around for a little shop to do my leather work in. In June of 1975 I spotted my location and that’s where I’ve been ever since. HW: What are some of your favorite pieces that you have created? Jackie: That’s a hard question! Everything I create is one of a kind, they are all exciting and interesting. I guess my fa­vorite pieces are for clients who are really open minded, someone who has a lot of confidence in my ability, and who gives me the go ahead with not much of an outline, and lets it be open to me. HW: Being in Malibu have you ever done work for any stars? Jackie: I’ve done work for many stars, I have movie star pictures on my walls. I don’t like to play that end of my business up for a couple of reasons… one of them is that Malibu is a really casual community and people that are well known really like the fact that they can hang out here and be really natural, and not be hassled. The other reason is because most of the people I work for are not stars. HW: What percentage of your custom­ers are riders? Jackie: I’ve been in business for fifteen years, the bike thing has gotten really big within the last five years. Naturally since I have started riding, I have a lot more to offer. Anyone that comes in my shop who is a biker, I can really relate to. I know what is needed for riding. I understand what a rider is looking for in a custom jacket, chaps, saddlebags,or whatever. HW: How has riding effected your business? Jackie: Since I started riding, it has really enhanced my business. People really notice me on my bike, I make all the leathers that I wear and all my husband’s leathers. When we are riding it is like a loudspeaker advertising my shop. Rid­ing has been a real positive boost to my business. HW: What do you want for Christmas? Jackie: A customized 1982 FLH!